Resist is used to draw the outline of an image on silk. Used with liquid dyes, the Gutta stops the flow of dye at the resist lines. 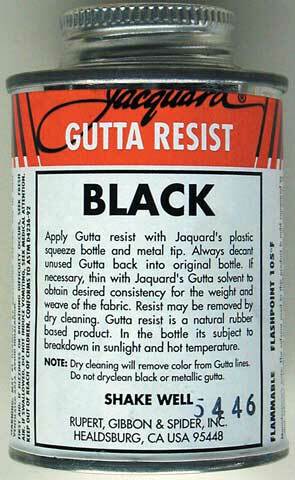 Jacquard's Gutta Resist is made from natural Gutta Percha which produces the finest resist available. Any resist should be completely dry before applying dye. Gutta is removed from fabric by dry-cleaning. Colored guttas are intended to remain on the fabric and should not be dry-cleaned.